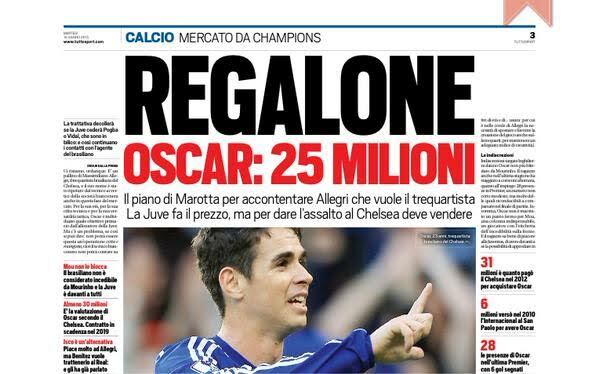 Juventus manager Masimilliano Allegri has made Chelsea midfielder Oscar his primary target for the transfer window. In a story covered on the front page by Italian newspaper Tuttosport, the Brazilian could find himself playing for the Serie A champions next season if the right offer comes along. According to the report, Juventus are willing to offer €25 million for the playmaker, while Chelsea value him at €30 million. 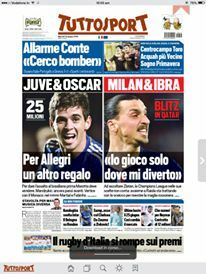 Allegri is a big fan of Oscar, who he considers to be a technically sound player with a lot of tactical awareness. The attacking midfielder was left out of the Brazilian squad for the currently ongoing Copa America with an injury, but will be fit to start next season. The 23 year-old was considered to be one of Jose Mourinho’s favourite players not too long ago, in particular due to his hard work and determination to help out his side defensively as well. But, in each of the last two campaigns, his form in the second half of the season has been miserable. In the 2014/15 campaign, his last goal of the season came in January and since then, he was quiet all the way through. Oscar was signed by Chelsea from Brazilian club Internaciole in 2012 for £25 million. Incidentally, he burst into the limelight with his performance against Juventus in a group game in that season’s Champions League, scoring a brilliant brace at Stamford Bridge against the Old Lady. There is the feeling though, among Chelsea fans, that he has never really kicked on and reached the heights that he promised when he was signed. After 12 goals in all competitions in his first season, he only managed 11 and 7 respectively in the last two years. Juventus had a memorable season last year, winning their 4th straight Scudetto title and also reaching the Champions League final, where they lost to Barcelona. Allegri has done a great job with his squad, but with both his central midfielders Arturo Vidal and Paul Pogba fiercely targeted by top sides around Europe, there is a need to strengthen that area. Sami Khedira has already been signed, and if their pursuit of Oscar doesn’t end in success, they will reportedly look at signing Real Madrid’s Isco. Juve have also strengthened their forward line, bringing in Paulo Dybala and being close to finalising a deal for Mario Mandzukic. Already past date,no day he will play for Chelsea,four years younger than Falcao,useless. How will real Chelsea fan ignore his own players,do you think Quadrado started playing football for Chelsea or he was from another club. Juventus are Cheating themselves,how will Pogba cost such amount while with less than 8 goals a season in such a simple league.I dont see the difference between him and Oscar that will make them value oscar at less than 25 million pounds.Osar is still young and in a difficult league,He will change after he get matured.Can someone tell me the difference between Pogba and Verratti and why Pogba is being rated high than him.Its business i think,they need to sell so as they get enough money to strenthen their squard with the sale of one.